A native of Los Angeles, cellist Evan Kahn has been praised as “a cellist deserved of serious listening” for bringing his “electrifying … nuanced and colorful” style to all of his collaborations, from concerti to chamber music to contemporary performances. Intensely passionate about new music and music of non-Western cultures, he has commissioned and premiered over 45 works by composers from around the world, including his father’s Cello Concerto. Evan currently serves as principal cellist of Symphony Silicon Valley, as well as assistant principal cellist of both Opera San Jose and West Bay Opera. 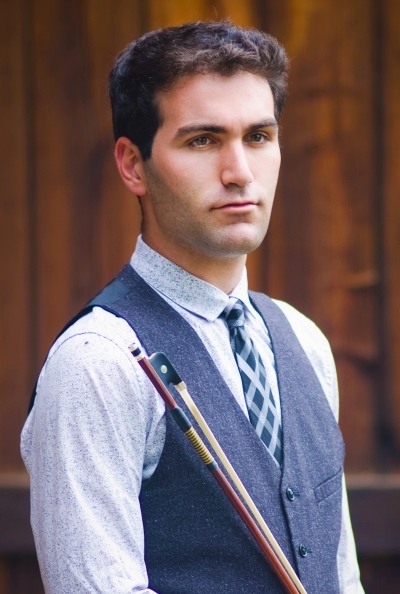 As cellist in the Lazuli String Quartet/Sutro Strings, Evan plays in many local chamber music concert series, and is a sought-after quartet and piano trio cellist in the San Francisco Bay Area. His Pittsburgh-based piano trio, Trio Rizi, won the top awards in the Silberman Chamber Music Competition and the Pittsburgh Concert Society Competition. He also frequently performs with San Francisco Conservatory faculty, and recently collaborated in performance with Geoff Nutall, Donald and Vivian Weilerstein, Kim Kashkashian, and members of the Miro and Telegraph Quartets. Evan is a resident cellist for several Bay Area music collectives and ensembles, such as After Everything, Mythica Foundation, and hip-hop band Ensemble Mik Nawooj. As a soloist, he has performed with North State Symphony, Symphony Silicon Valley, the Veridian Symphony Orchestra, Segah Festival Orchestra, Diablo Symphony Orchestra, and Pittsburgh String Orchestra, as well as the Carnegie Mellon Philharmonic and San Francisco Conservatory Orchestra, after winning both institutions’ concerto competitions. In April/May 2018, he served as Artist-in-Residence with Performance Today at NPR, sharing some of his favorite works for cello and his philosophies on music and life. Evan attended Aspen Music Festival on a fellowship, where he studied with Julliard professor Darrett Adkins and played co-principal in the Aspen Academy of Conducting Orchestra, the Aspen Sinfonia Concertante, and the Aspen Philharmonic as an Orchestral Leadership Fellow. In summer 2016, he served as one of 40 student fellows in the Piatigorsky Cello Festival — fellows hand-picked from conservatories around the world — and in summer 2017, Evan attended the Taos School of Music to work with the Brentano, Borromeo, and Shanghai Quartets. A recipient of a instrument grant from the Maestro Foundation, he has the great honor and pleasure of playing on the foundation’s “Mendelsohn” cello, a 2001 instrument by Mario Miralles named after the foundation’s head, Aaron Mendelsohn. Evan plays with a Paul Martin Siefried bow, also leant to him by Maestro, and a Belgian bow by Pierre Guillaume. Evan received a Master’s in Chamber Music at San Francisco Conservatory of Music, studying with Jennifer Culp. He graduated with college and university honors from Carnegie Mellon University, where he served as principal cellist of CMU orchestras and studied with David Premo. At CMU, he received awards such as The Harry G. Archer Award for Outstanding Senior, Presser Scholarship, four years’ worth of the Wilkins Cello Scholarship, and first prize in the Carnegie Mellon Concerto Competition. Before college, he took lessons with LA Opera principal cellist John Walz and Lyris Quartet cellist Timothy Loo, and loves playing for them whenever he visits Los Angeles. Other important mentors include Paul Hersh, Thomas Loewenheim, Amos Yang, Ian Swensen, and Bonnie Hampton. In addition to performing and teaching, Evan enjoys making curry, reading postmodern fiction, and watching The Great British Bake Off. Widely admired as a dynamic, creative and engaging conductor, Lara Webber is dedicated to inspiring audiences through the power of symphonic music. She has been praised by fellow musicians around the country for her musical depth, genuine expression, strong personal vision, and collaborative spirit. Ms. Webber brings a broad range of experience to the podium. She has held the positions of both assistant and associate conductor of the Baltimore Symphony Orchestra. Prior to her appointment with the BSO, she was associate conductor of the Charleston Symphony Orchestra (South Carolina), and music director of the Charleston Symphony Orchestra Chorus. Lara currently serves as Music Director and Conductor of the Livermore Amador Symphony. Her career began as music director and conductor of the Los Angeles Debut Orchestra, a post previously held by such conductors as André Previn, Lawrence Foster, and Michael Tilson Thomas. among several others. She has served as a cover-conductor for the San Francisco Symphony and The National Symphony Orchestra. Ms. Webber’s operatic associations include posts as the assistant conductor at Glimmerglass Opera, and conductor of the Baltimore Opera Studio. Strongly committed to arts education and community engagement, Ms. Webber was a conductor of the Emmy-nominated Disney's Young Musicians Symphony Orchestra. These concerts were broadcast nationally by the Disney Channel to millions of viewers nationwide. She has taught student conductors as a faculty member of the League of American Orchestra’s Conductor Workshops, and has coached youth orchestra and community orchestras. At home in Livermore, Lara is active in her community, bringing music to the local elementary schools, coaching chamber musicians and advocating for the arts as an essential part of the educational curriculum, and a vital part of our culture. Ms. Webber began her conducting studies at the Oberlin Conservatory of Music with Robert Spano, where she received her Bachelor of Music degree in Vocal Performance in 1991. Her studies continued at the Sweelinck Conservatory in Amsterdam and in the conducting seminars of the both Aspen and Tanglewood Music Festivals. Ms. Webber received her Master of Music degree in Orchestral Conducting from the University of Southern California, where she studied with Daniel Lewis. Ms. Webber was among the first conductors selected to participate in The League of American Orchestra's National Conductor Preview. In recognition for her outstanding service to the community, Lara was honored with a Los Angeles City Council Resolution, upon completion of her tenure with the Debut Orchestra.